James’s itinerary and the stops he made on his 23-day art road trip. Earlier in the year I made the ambitious decision to take an extended road trip across the West. The goal, to meet various artists and ask the question: what’s it like to live, work and survive as an artist in your community, region or state? I had always been curious, after choosing to continue living in the South, in Kentucky, what it would be like if had I made the decision to live in a different part of the country ― and possibly what I was missing. First stop, Dallas. I’ll admit I had never been to Texas and really had no clue what to expect, but I feel like this was going to be my last taste of the South before journeying further west. Fellow artist, photo educator and friend Meg Griffiths joined me for the initial leg of my trip. I arrived after dark so she took me to a local drinking hole in the Oak Cliff neighborhood called Tradewinds Social Club. The next morning we set out for Marfa, a touted art oasis in the middle of the southwest Texas desert. No one warned me that once you pass the town of Sweetwater your only view for hundreds of miles is an endless flat horizon. For hours, we drove past oil fields and quickly learned that the preferred vehicle of choice in these parts is a souped-up pickup truck. A yurt at El Cosmico in Marfa. It isn’t until you get into West Texas that you start to get a better sense of perspective and why people are drawn to this landscape. Straight, flat, roads with 80-miles-an-hour speed limit, radiating with heat, peppered with the occasional dust devil. It’s a disorienting sight that makes you feel like you’re on another planet. This being my first time in the Texas sun, I was ill-prepared for this heavy slap of heat that follows you no matter which direction you turn. I was relieved that we arrived to our destination right as the sun was setting. If you haven’t heard, Marfa is a small town in southwest Texas, near the border with Mexico. Thanks to Donald Judd transplanting himself there at a former army base in the early ’70s, there is an amazing collection of his work and other artists he invited to work at his Chinati Foundation, which is now only one among a handful of art venues. The exhibits, the food and bar scene have tourists and art pilgrims flocking to this town. I didn’t expect the variety of unique accommodations there. I have never stayed in a yurt, teepee or mobile home, but there was my opportunity to fulfill a dream I never realized I had. Camp Bosworth in his studio at Wrong Marfa. Though, I only had a day in Marfa, I made a hardy attempt to see as much Judd as possible as well as the town itself. Meg and I set off for Chinati, where I wrangled a tour of Judd’s work and an interview with the Associate Director. After I fumbled my way through my Q&A and the director graciously gave us a tour of the work, Meg and I headed back into town to attempt to find some artists working in the community. After a little research, we stumbled into Wrong Marfa. It is a gallery and studio run by the curator-artist duo Camp and Buck Bosworth. Meg and I immediately got into some conversation about the city, the local art scene, my home state of Kentucky, and where to get the best burrito in town. I quickly discovered how helpful it was to have a sidekick on a trip like this, for Meg had a natural ability to engage and carry on conversation with anyone about any subject. While I was busy snapping pictures of Camp (the artist) and checking my focus, control settings and external flash, she was interacting and having an in-depth conversation with Buck and two of their artist/gallery owner friends about the greater Texas art scene. What I did catch: costs of studios have skyrocketed so high that it is hard to find an affordable space to work and many of the artists that do have studios in town work or live in New York City or Los Angeles. Meg Griffiths in front of Prada Marfa, an installation by Elmgreen and Dragset. 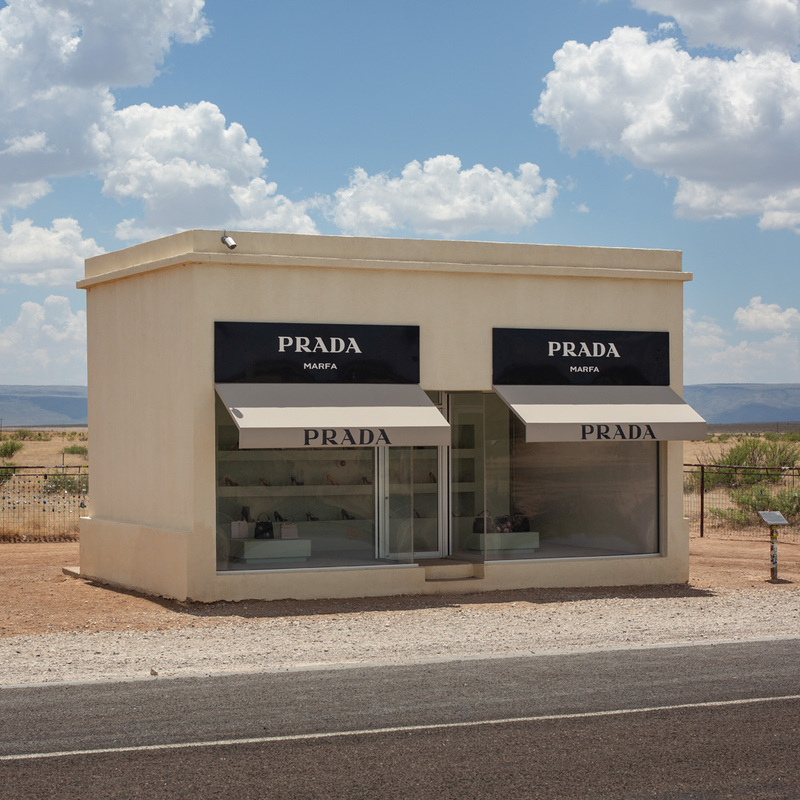 Then we hit the road to El Paso, but not before making the stop that every artist or art lover must make at Prada Marfa, an installation by Elmgreen and Dragset. I almost felt no need to take photos since the world has enough images of it, most famously the one where Beyoncé is jumping in front of it. But driving down that lonely road, it was just too enticing to pass up. So there we were, two photo nerds descending on Prada Marfa. Stephen Mueller, Ersela Kripa and Me at border. We hit El Paso midday during a heat wave, and checked into the last hotel that Dillinger stayed in as a free man, the Gardner Hotel. Soon after our arrival, the power went out, shutting down the entire block. With our plans to take a break and relax in some AC thwarted, we jumped back into work mode and headed down to Texas Tech University―El Paso, where my friends Ersela Kripa and Stephen Mueller were finishing up a meeting in the architecture department, where they are on the faculty. We heard all about their decision to relocate there from New York, their passion for border issues and all the ways in which they are working to build a unique program literally only steps from the wall. They have been working with students on both sides of the border, trying to infuse activism, problem solving, and connection into their art-making practice. While America and its leaders talk only about building walls and the many divisions between the two nations, Ersela and Stephen are working hard to show how interdependent these two communities are, especially in a city like El Paso. While getting a tour of the facilities, they offered us a tour of the border. We jumped at the opportunity and the next thing we know we were walking the bridges all along the Rio Grande. The first thing we noticed was the ever present border patrol. I don’t believe we went five minutes without seeing a couple of these green and white pickup trucks driving all over the hills and streets. While showing me where the border is only demarcated by the river, I spotted five border patrol trucks at once. The border in El Paso has a strong feeling of militarization. I could see what brought Ersela and Stephen to this city. Since I met them years ago, I always noticed how they searched for communities that were underrepresented, especially ones under strong governmental control. This town was a perfect amalgamation of both their research interests and a place to inspire and educate students on environmental and political issues on both sides of the border. While standing at the riverfront, discussing the difficulties of crossing over and how hard we’ve made it for individuals to enter legally, a train full of produce and products made south of the wall was rolling overhead into the US. View from the Airstream overlooking the US/Mexico border. We spent the rest of the evening at a bar/Airbnb on a hilltop overlooking the border wall, just over the Texas-New Mexico state line in a town called Sunland Park. Even with the beautiful vista outside the Airstream, the tall burnt sienna metal structure was imposing and industrial, like a fortress sans the majestic. While we sipped on our cocktails and discussed the recent news about the separation of immigrant children from their parents, we got word from the proprietor that someone had just crossed the border and was seen walking through the parking lot. While I was sitting there chatting with friends about this very subject, I had forgotten that the reality was right outside the door. Ginger Porcella at Tucson MOCA. After dropping off my dutiful assistant and travel partner at the airport, I left Texas to go deeper into the desert. I had picked a route that hugged close to the Mexican border. Driving straight to Tucson, my only stops were for chile rellenos, sopapillas and the border patrol checkpoints set up along the highway. My first day in Tucson, I got up early to prepare for the day’s interviews and studio visits. I set out for the Tucson Museum of Contemporary Art to talk to the new executive director and chief curator Ginger Porcella. Their museum in a converted fire station is spacious. Ginger told me about how she and her crew expanded the upper floors to house classrooms and an artist residency in hopes of attracting international artists as well as those based in the US and the local area. Walking the halls, viewing room after room, I was impressed with the amount of space they have. Ginger also filled me in on the move she and her husband had made from San Diego to Tucson. She felt the more metropolitan and liberal Tucson made for a tighter community that’s more critical of current issues and contemporary art. This sentiment was reiterated only hours later when I met her other half, the artist Don Porcella, in his studio up in the suburbs in the hills. Passing cacti-filled cul-de-sac after cul-de-sac, I found the garage studio overlooking the city. I joined Don and his studio assistant as they were preparing for an upcoming show. Watching him intricately weave bright pipe cleaner into a sculptural form, he told me about his interest in his mother’s weaving. You can see it in the craftsmanship he utilized to create his playful figures and landscapes. Sitting around the picnic-like studio setup, I heard even more about his and Ginger’s transition from the coast to the desert. Don also worked in NYC before coming to the West Coast, where he maintains a studio space in LA, though he prefers to live and work in Tucson. It was here that I first started to hear people talk about space. Having space and time to work just isn’t common in LA or New York, something I’d be hearing every time I got away from the coasts. Don Porcella and one of his faithful chihuahuas. After a hydration break with Don and his chihuahuas, I headed down out of the hills to visit another artist. I was eager to meet up with Sama Alshaibi, not just due to the fact that I enjoy her work, but also because she’d be the first studio art academic at a large state college on my trip. I teach at a similar state college in Kentucky, and I have been eager to find out how someone out here balances academia and a thriving studio art practice. Sama and I arrive at her studio simultaneously, so I helped her carry an armful of props and materials for her latest project. Even though it had been over a month since our semesters had ended, we both eagerly exchanged stories about administrative work, and teaching full time while making the time to work in the studio. Sama told me about her transient life leading up to her job at the University of Arizona. I had always known that my experience of floating around from city to city and residency to residency wasn’t rare, but it was reassuring to hear someone else’s story. For her, Tucson is the perfect location. She knew she wanted to be in one of the deserts of the Southwest, and she also wanted to work in an academic program that’s tightly connected to the local art community. I could easily say that the University of Arizona has its finger on the pulse of Tucson’s art scene, just as my university has on my hometown’s. Utilizing your surrounding environment and community to help build your art practice materially and conceptually requires that you pick your home wisely. Looking at her work again, I slap myself for believing the bulk of it solely referenced politics, when it’s two-fold landscape and art history as well. Galen Trezise behind his work. I was thinking about Sama’s work, her studio practice and how it connects to her teaching, and I wanted to see how this affected her students. I kind of saw myself having a very similar work style, so I wondered if it affected my students as they interact with me and respond to my teaching. I found Galen Trezise, one of her more recent graduate students, in his recently emptied studio on campus with only a few large sculptures. His work is tall, wiry and eerily organic with vibrant hues accenting the coating. While learning more about his process and where he was interested in getting his work into the LA scene, I found myself falling into the educator’s role and started to critique his sculptures. Attempting to take off my teacher’s hat and actually engage with this young artist coming straight out of Sama’s program, I wanted to know how the Tucson area affected his work and his plans for the future. Galen couldn’t find any part of his work that reflected his surrounding community. He felt his work came more from his personal interests and his predilection for industrial materials. When I asked about his next step, he said he wanted to stay around for a year to work in Tucson since studios were so cheap in town. I should have gasped when he told me his studio was under $500 a month, though I didn’t know that I would not hear a price that low for the rest of my trip. Either my brain was cooked from being in the desert for a week or I was eager to get to the coast. I couldn’t get my mind off what I might find in California the following day. I kept meeting people from Texas to Arizona that were either coming or going towards Los Angeles or New York. It seems everywhere you go in the US, the talk is always on these two art hubs. I was eager to finally make my way to LA for the first time and see what the hype was all about. Come back next week for Part II of James’s art journey. James in Lexington, about to embark on his road trip. Inside the yurt guest room at El Cosmico. The outdoor shower at El Cosmico. One of the buildings in downtown Marfa belonging to the Judd Foundation, which preserves his living and working spaces in Marfa and New York. James’s travel partner through Texas, Meg Griffiths. James Southard inside Robert Irwin’s 2016 installation untitled (dawn to dusk) at the Chinati Foundation. Dust devils can be regularly spotted in West Texas. View of Elmgreen and Dragset’s Marfa Prada on the outskirts of the town. James taking a photo of Marfa Prada, photographed by Meg Griffiths. View of El Paso, Texas. (L to r) Stephen Mueller, Ersela Kripa and Meg Griffiths discussing border architecture at the Texas Tech-El Paso architecture department. (L to r) Stephen Mueller and Ersela Kripa provided a tour of the US/Mexico border. James enjoying a burridto in Marfa, photographed by Meg Griffiths. View of industrial structures along the Rio Grande in El Paso. Google aerial view of oil fields in west Texas. 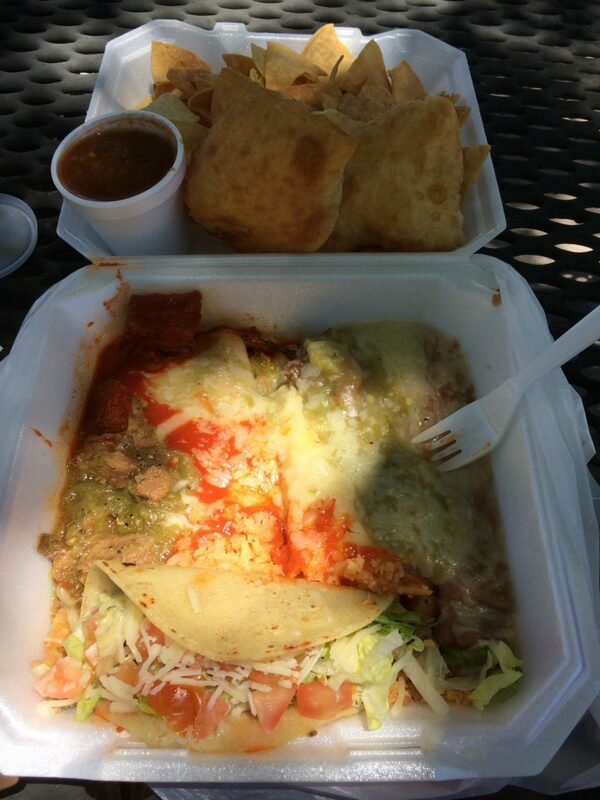 Chile rellenos, tacos and sopapillas in southern New Mexico. Don Porcella with some of his artworks. Sama Alshaibi with one of her artworks. Galen Trezise next to one of his works at the University of Arizona studio building. 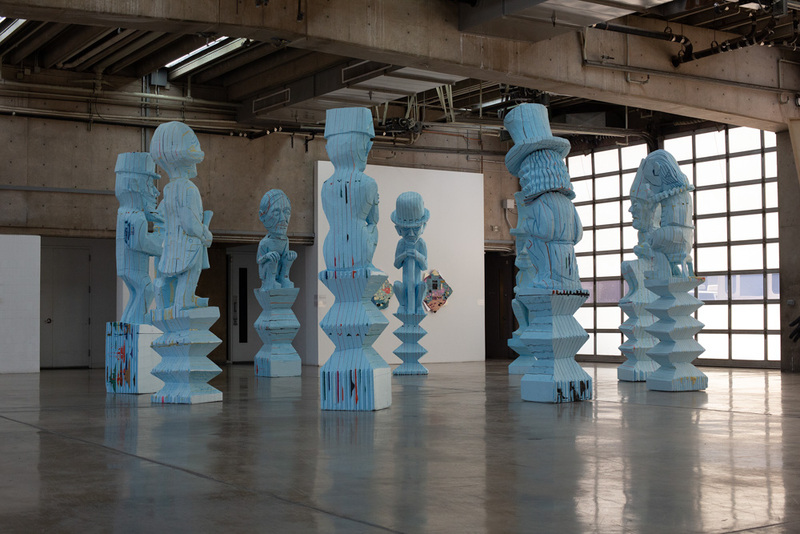 Installation view of Folkert de Jong’s exhibition at the Museum of Contemporary Art in Tucson. Detail of a Folkert de Jong work at the Museum of Contemporary Art in Tucson. A work on view in the Folkert de Jong exhibition at the Museum of Contemporary Art in Tucson. View of the Biosphere 2 in Oracle, Arizona. James Robert Southard is a photographer, writer and educator at the University of Kentucky where he is a lecturer. His work is based around collaborations with various communities in Wyoming, Vermont, South Korea, Cuba among others. He uses digital editing to combine hundreds of images of people, materials and locations to build large photographs and videos that reflect these people’s and region’s concerns, hopes and history.